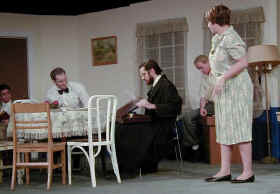 Yep, from October 26 through October 30, I played "Wilbur C. Henderson" in the play called "You Can't Take It With You". My character is an 1930's Internal Revenue Department representative who has come to yell at Mr. Vanderhof for not paying his income tax for 22 years. 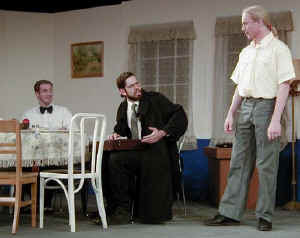 The play was directed by Jennifer Johnson. Here's an action shot of me yelling at Grandpa.